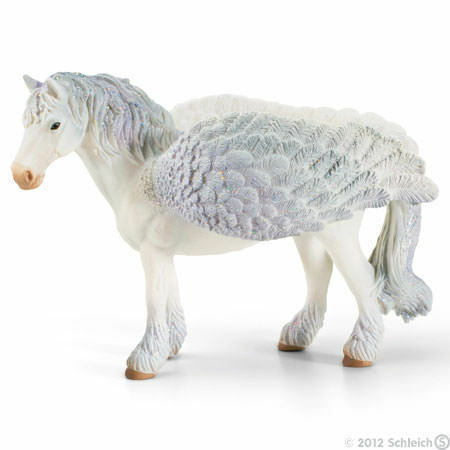 Pegasus Standing with Glitter Wings Figurine from Bayala series. Made by Schleich in 2016. In Bayala there are so many wonderful and rare creatures. The noblest animals in this world are winged horses. One moment they are grazing peacefully on the bank of the elf stream, the next instant they stretch out their powerful wings and vanish with a few beats of their wings on the horizon. Only truly select elves may ride along on their backs. Do you know such an elf?